When the writer Dante Alighieri was unceremoniously kicked out of Florence, he wandered around for a few years, finally finding refuge in Ravenna. In this city in the Emilia-Romagna region, Dante found such hospitality and care that he praised Ravenna in his most famous work, The Divine Comedy. Ravenna has repeatedly rebuffed Florence’s attempts to reclaim their exiled son, reminding them unequivocally that it was Ravenna that gave him safe haven; in fact, it was here that Dante wrote the “Paradiso” portion of his epic poem. Today, seven centuries later, Ravenna is still a friendly and hospitable city, a pretty urban paradise that welcomes foreigners and Italians alike, and instills a feeling of acceptance. Not just Dante, but Oscar Wilde, Cole Porter, and Henry James praised the place in prose and song. There’s plenty to be enamored with. Art, history, culture, and beauty; Ravenna has it all. The only thing it doesn’t have is crowds. It is classy and elegant, yet there’s nothing austere about it. The city retains its Old World Italy appeal but mixes it up with a modern vibe; contemporary structures blend in with the old, even in the historic quarter. Ravenna has a sunny disposition about it, with pastel-tinged stucco- and portico-punctuated buildings. Ravenna was a bridge between Europe and the eastern world, and its Byzantine mosaics are a UNESCO World Heritage site. These wondrous works are so brilliant they nearly blind you. Around town, it’s almost as if the luminous quality of the mosaics has spilled over to the character of local life. But Ravenna largely remains off the expat radar, which is strange, because the city of 165,000 residents has dozens of museums and monuments, even beyond the mosaics, along with a vibrant velvet-draped theater and a healthy literary life, as well. I counted nine bookstores in my wanderings around the old town; and the Ravenna festival features a rich line-up of concerts and events. I enjoyed strolling down Via Cavour and Via Matteotti with the upscale boutiques and mid-range shops keeping pace with fashions in the more famous Italian cities. But I’m not much of a shopper, so thankfully I found my haven in Piazza del Popolo, Ravenna’s central square, the perfect gathering spot for a drink amidst Venetian-style architecture. Here I refueled, first with artisan chocolates at the piazza-side pastry shop and then with a fancy fruit-rum drink at Bar Bollicine, served with a splashy plate of nosh—included in the €7 ($8) price. The city offers excellent dining options, with the meat-rich dishes the Emilia-Romagna region is famous for, but also plenty of seafood options because the Adriatic coast is just a stone’s throw away. Ravenna is a delightfully walkable place, fun to wander and discover all the things tucked in among the pastel palaces and pretty streets. But the bicycle is the preferred mode of getting around town, with rows of bikes parked in every street and square. This is also one of the more user-friendly cities I’ve encountered, with plenty of signs and friendly folks quickly offering directions. Ravenna is a bit of a landed island, the city giving way to plains, hills, and the sea. It used to be a Roman seaport before the sea retreated, and part of the Po Valley, before the river changed its course, leaving it to its own identity. With an easily-accessible Adriatic shoreline and rail connections to Venice, Rimini, and Bologna (and beyond), it is not remote at all, yet feels like a world unto itself, which may be why it is consistently rated as among the best quality-of-life locations in the country. Ravenna isn’t cheap, nor is it too expensive, either. It’s the kind of city that has an upscale, refined quality but isn’t flashy about it. Rental prices in the city center range from €450 a month to €800 a month for furnished apartments. Real estate prices reflect Ravenna’s quality of life. I spotted a stylish renovated one-bedroom loft apartment with wood floors just outside the historic center in a well-served area with shops (butchers, bakers, pizza makers, along with coffee bars and gelato) for sale for €129,000 ($147,131). I was taken with a cute two-story townhouse in a quiet residential zone at the edge of the historic district. It has two bedrooms, two baths, a garage, and an enclosed outdoor courtyard for €175,000 ($199,597). If it’s a country villa you’re dreaming of, you can find that here, too. A large villa with stone accents, a fireplace, a country-style kitchen, three bedrooms, and two bathrooms, along with a big garden looking out over the fields (but still only about 20 minutes from the city) costs €345,000 ($393,491). 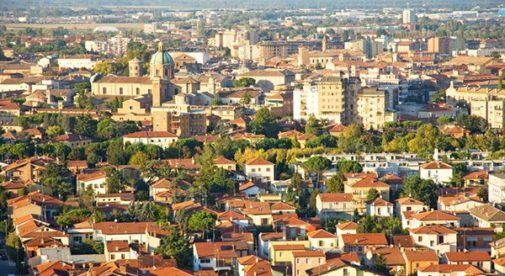 You don’t have to be a literary genius like Dante to experience Ravenna’s warm welcome and sense of belonging, though the city’s friendly demeanor may just inspire you to pen its praises as an expat paradise.